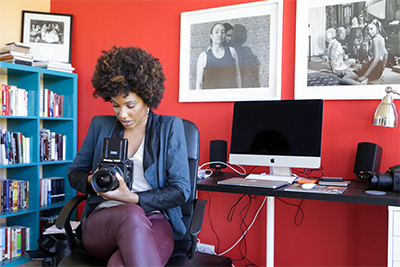 Photographer and video artist LaToya Ruby Frazier G’07, a graduate of the College of Visual and Performing Arts’ Department of Transmedia, has been named a 2015 MacArthur Fellow by the John D. and Catherine T. MacArthur Foundation. Frazier, who earned a master of fine arts degree in art photography, is one of 24 fellows who will receive a “no-strings-attached” stipend of $625,000 over five years. The MacArthur Fellows Program awards unrestricted fellowships to talented individuals who have shown extraordinary originality and dedication in their creative pursuits and a marked capacity for self-direction. There are three criteria for selection of fellows: exceptional creativity, promise for important future advances based on a track record of significant accomplishment and potential for the fellowship to facilitate subsequent creative work. 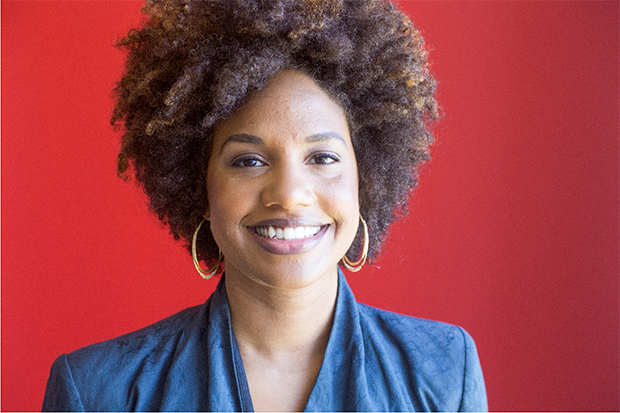 Watch Frazier speak about her work and receiving the fellowship. Frazier G’07 uses visual autobiographies to capture social inequality and historical change in the postindustrial age. Frazier uses visual autobiographies to capture social inequality and historical change in the postindustrial age. Informed by documentary practices from the turn of the last century, Frazier explores identities of place, race and family in work that is a hybrid of self-portraiture and social narrative. The crumbling landscape of Braddock, Pa., a once-thriving steel town, forms the backdrop of her images, which make manifest both the environmental and infrastructural decay caused by postindustrial decline and the lives of those who continue—largely by necessity—to live amongst it. “The Notion of Family,” a series of unflinching black-and-white photographs, shows her mother, grandmother and the artist herself in a Braddock unmoored by disinvestment and demographic decline. Frazier’s stark portraits underscore the connection between self and physical space and make visible the consequences of neglect and abandonment—unemployment, environmental health crises and lack of access to services—for Braddock’s historically marginalized working-class African American community. In a photolithograph and silkscreen print series from 2011 titled “Campaign for Braddock Hospital (Save Our Community Hospital),” Frazier sets up an ironic juxtaposition between upbeat consumer capitalism and the challenges of working people. Images of Braddock from a 2010 Levi Strauss campaign bearing the slogan “Ready to Work” are set in counterpoint to quotes from Braddock residents about the closure of the town’s only hospital—and its principal employer—that same year. In more recent photographic work, Frazier documents Braddock from the skies in full-color aerial shots that record the extensive transformations of a community after years of economic collapse. Frazier’s uncompromising and moving work illustrates how contemporary photography can open conversations about American history, class structures and social responsibility. In addition to her degree from Syracuse University, Frazier received a bachelor of fine arts degree in 2004 from Edinboro University of Pennsylvania. She held artist residencies at the Lower Manhattan Culture Council (2009–10) and the Whitney Museum of American Art Independent Study Program (2010–11) and was the Guna S. Mundheim Fellow at the American Academy in Berlin (2013–14) before assuming her current position as assistant professor in the Department of Photography at the School of the Art Institute of Chicago. Frazier’s work has appeared in numerous exhibitions, including solo shows at the Brooklyn Museum; the Institute of Contemporary Art, Boston; the Seattle Art Museum; and the Contemporary Arts Museum, Houston. “The Notion of Family,” Frazier’s first book, was published in 2014.